Shifted floor plates and slanted elements lend an off-kilter appearance to a boutique hotel in a Denver art district, designed by US firm Dynia Architects. 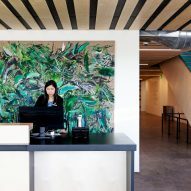 The eight-storey building sits along a major boulevard in the River North Art District (RiNo) — an industrial area that is quickly transforming into a live-work-play zone. 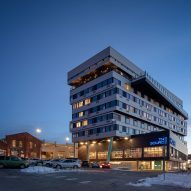 As one of the first hotels in the district, The Source Hotel "further cements the neighbourhood's reputation as Denver's cultural hub", said Dynia Architects, which has offices in the Colorado city and Jackson, Wyoming. Many of the area's new buildings have a simple, boxy shape. In contrast, the 84,752-square-foot (7,874-square-metre) hotel has a dynamic, off-kilter form. Rising up from a two-storey podium is a six-storey mass that angles across the site, with shifted floor plates forming cantilevers and setbacks. Exterior walls are clad in black and silver metal, giving the building an industrial look. On the northeast elevation, an exterior column is slanted and painted bright aquamarine. On the northwest side, an angled balcony juts out from the upper portion of the building. The hotel is an extension to an existing building – The Source, an artisanal market hall that occupies a brick structure dating to the 1800s. The hotel is designed to work in concert with its neighbour, which has served as a nexus of "art, design and culinary innovation" since opening in 2013. Situated between the two buildings is a landscaped courtyard and a metal connector bridge. "The project creates a powerful duality between the iconic and historic 1880s warehouse that holds the existing Source, and the contemporary new build," said Dynia Architects in a project statement. The hotel contains 100 guest rooms, along with a range of amenities and public areas. The ground level houses the reception zone, a small-batch brewery and a barbershop. The second storey encompasses boutiques, an art gallery, a coffee station, two restaurants and an event space. High ceilings, exposed structural elements and economical materials are found throughout the building. 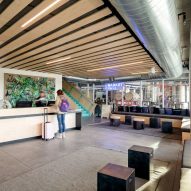 "From the rooms to the shared spaces, industrial sensibility is contrasted by light, warm wood and touches of natural elements," the team said. Guest suites are distributed across floors three to seven. Rooms are fitted with either king or queen beds. 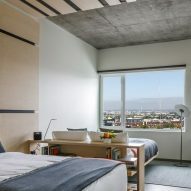 In the double rooms, beds are placed perpendicular to one another rather than side by side – with one bed oriented toward the window and cityscape. 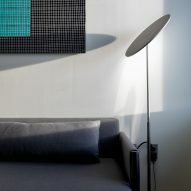 Rooms feature polished concrete floors, birch casework and contemporary furniture. Pillows were custom-made by Winter Session while blankets were designed by Wunder Werkz – both local studios. In certain rooms, the team incorporated glass garage doors that raise up, enabling an abundance of light and fresh air to enter the space. Select rooms also feature small, round bathtubs in the sleeping area – which the team designed to allow guests to enjoy a bath while taking in views or even watching television. 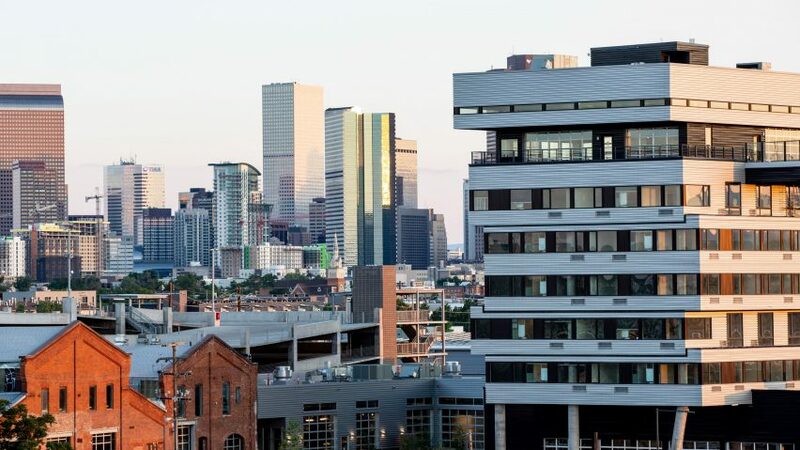 On the eighth floor, a gastropub opens onto angled patios with sweeping vistas of the skyline and the Rocky Mountains in the distance. This level also offers a pool and jacuzzi for hotel guests. 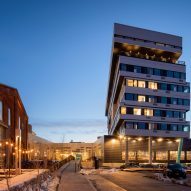 The Source Hotel is one of the latest projects in the fast-growing RiNo District, where the city has recently invested $29 million (£22 million) to create bike lanes, sidewalks and new landscaping. Another project in the area by Dynia Architects is Zeppelin Station, a four-storey building with offices and a food hall. Adjacent to a swath of rail tracks, the building features a bright red wall that catches the attention of passing train travellers. Photography is by JC Buck, unless stated otherwise.